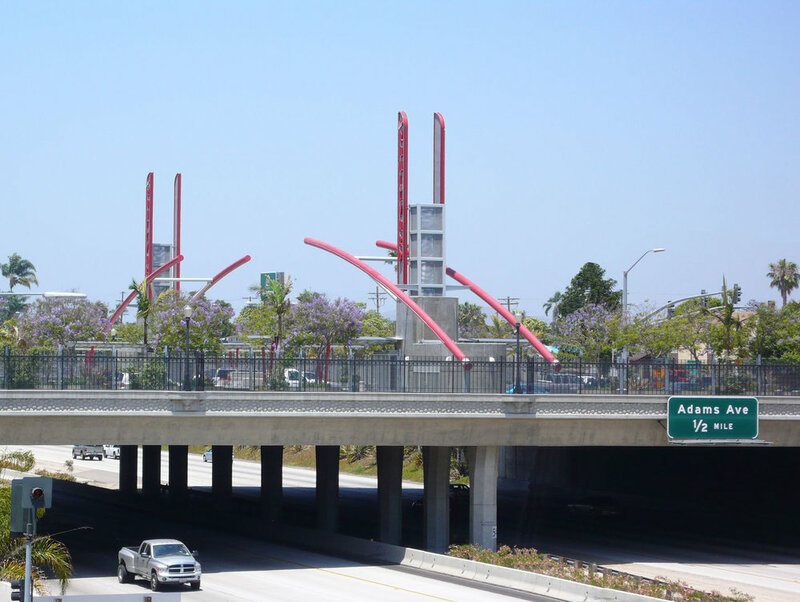 Project Description: The site-specific transit plaza neon gateway sculpture features over the road arches and vertical blade signs that create a portal to this historic San Diego community while referencing El Cajon Boulevard’s architectural past. Project Description: The theme of the light sculpture is aviation and San Diego’s long association with the aerospace industry. It features tools used for navigation such as sectional charts of four area airports along with references to radar, navigation and space. Project Description: "Archaic Passage" incorporates the architectural styles and building materials used in Old Town San Diego throughout its history. Responding to the passageway’s historic backdrop and its orientation underground, the materials are arranged in serpentine cross sectional views that evoke a feeling of being inside an archaeological dig.